Note: You can enter this giveaway two (2) times per e-mail address per day. Deadline is 11:59PM ET 1.31.19. 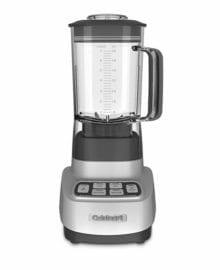 Keep those New Year’s resolutions on track with the Cuisinart Velocity High Performance Blender. This powerful blender helps you make healthy Green Smoothies, a Blender Hollandaise or the occasional indulgent milkshake with ease. The simple-to-use speed control dial allows you to choose from low or high speed and provides a precision pulse. The blender has a 56-oz. jar capacity and ultra-sharp stainless steel blades to power through food and ice. And as we all know, if it’s easy you’re more likely to stick with it – healthy eating included. NO PURCHASE NECESSARY TO ENTER OR WIN. Void where prohibited by law. Open to legal residents of the 50 U.S., D.C. and Canada (excluding Quebec) who are at least eighteen years old at the time of entry and have internet access. Begins on 12.6.18 at 12:00:00 a.m. ET and ends on 1.31.19 at 11:59:59 p.m. ET. To enter the giveaway, submit your full name and email address on this form. Odds of winning this giveaway depend on the total number of eligible entries received. Only two (2) entries per email address per day. Sponsored by Leite’s Culinaria, Inc. For more information, visit our Official Rules. Be sure to add giveaways@leitesculinaria.com to ensure notification if you are the winner.